I-CAR®, the Inter-Industry Conference on Auto Collision Repair, has named Clark Plucinski as the recipient of its 2018 Chairman’s Award. The award recognizes an individual or organization whose contributions to I-CAR have been significant or extraordinary. The Chairman’s Award recipient is selected by the Executive Committee of the I-CAR International Board of Directors. Plucinski currently serves as the executive director of the Collision Repair Education Foundation (CREF), as well as chairman of the Certified Automotive Parts Association (CAPA). He has nearly 50 years of experience in the collision repair industry, and maintains a strong commitment to attracting high-quality technicians to the industry. In 1970, Plucinski began his career as a collision repair technician at a major General Motors dealership. He then became co-owner and president of BCP Auto Body, Inc., a four-location collision repair business, before joining True2Form, a chain of 43 collision repair businesses, as executive vice president of sales and marketing. True2Form was later acquired by the Boyd Group, and Plucinski served as executive vice president of Gerber Collision & Glass prior to joining CREF. Plucinski has held various board seats with CREF, CAPA, I-CAR and the ASA Collision Division Committee. He also served as president of the Washington Metropolitan Auto Body Association. His industry awards include the I-CAR Founder’s Award and ASA Special Achievement Award. Plucinski was elected to the Hall of Eagles, and named Collision Shop Executive of the Year for 1996 by BodyShop Business. The Chairman’s Award was presented on October 31, 2018 in conjunction with the 2018 SEMA Show in Las Vegas, Nevada. 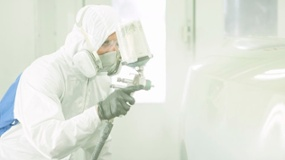 Being profitable in the paint shop starts with listening to your painters. See how real shops changed things in their paint areas and saw fast results in this whitepaper.